The Rural Rambler: Americorps Update - Reporting from the Home Office! 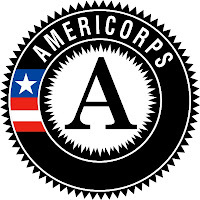 Americorps Update - Reporting from the Home Office! We're about halfway through the first year of our new Americorps Watershed Program here at Rural Action and it's time for a look back at some of the incredible work going on in our communities. This just in from the home office in Trimble, a report from our very own Candi Withem on whether our Americorps members have what it takes. (Here's a hint, they do) Read on for details about the Martin Luther King Day of Service at Trimble Local Schools and, for you number crunchers, service data worthy of a spin around the ol' abacus. Besides doing sampling, data analysis, grant writing and community outreach our AmeriCorps members were busy this new year giving back to the community. Americorps members serving in Rural Action Watersheds participated in a Martin Luther King Day service project through a collaboration with Ohio University ComCorps members and Trimble School Social Worker Kerri Shaw. In this fourth MLK Day project organized by ComCorps and the school, the theme was Native American culture. Thirty-five 1st through 4th grade students participated in activities designed to help them understand and appreciate another culture without prejudice and stereotyping. Rural Action members researched and developed age appropriate Native American games and crafts for the students. The younger children made a matching game using Native American symbols and learned the meaning and significance of each. Older students made a Serpent and Stone game similar to checkers using dried beans. Children took the crafts home with them at the end of the day. Members and the children also played games such as the Wood Gatherer and a modified Follow the Leader. Lunch and breakfast were served as well focusing on foods present in the Native American diet such as fry bread, beans, cornbread and berries. A drum circle finished out the day. This collaboration with the ComCorps members was a great success and we are hoping to plan other joint activities in the coming months. Besides this one great event, overall statistics for the first six months of the Americorps Watershed program are impressive. 150 citizen volunteers have become involved through member initiatives serving over 380 hours. The Americorps themselves spent over 500 hours water sampling and monitoring streams and 191 hours analyzing the data collected. The results should prove to be very beneficial for the watershed groups involved with the project. Much, much more to come and with spring coiling to strike, things will only get busier in the months to come. 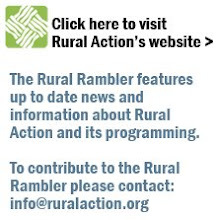 Keep checking back with the Rural Rambler for more updates on your community's Americorps in Action!